Can't thank everyone who showed up to support us at our Deadend Magazine Store grand opening! We had over 200 people and who knows how many classic cars take over Monterey St. We are forever grateful! As you can assume we were all busy and didn't take too many photos. (we know there were many photographers there shooting so we hope to share those with you soon) Here are a few shots we did manage to capture. Some of our friends showed up hours before we officially opened to grab prime parking. The front of the store moments after we opened. Cars from San Jose & San Francisco got prime parking right in front. Ruben Cardona debuted his 1937 Zephyr that night and got the well-deserved attention. Oldies Car Club showed up. Grumpy's Riviera always looks good. A couple nice rides from the bay area. A few cool Impalas looking for parking. Both sides of the street were packed with classics. Legendary Speed from Santa Cruz, CA showed up in a neat hot rod. Thanks again! We've been working hard on the store and glad many of you showed up to celebrate with us. If you didn't get a chance you can stop by Monday - Friday 12pm - 8pm 16 Midtown Lane Salinas California 93901. 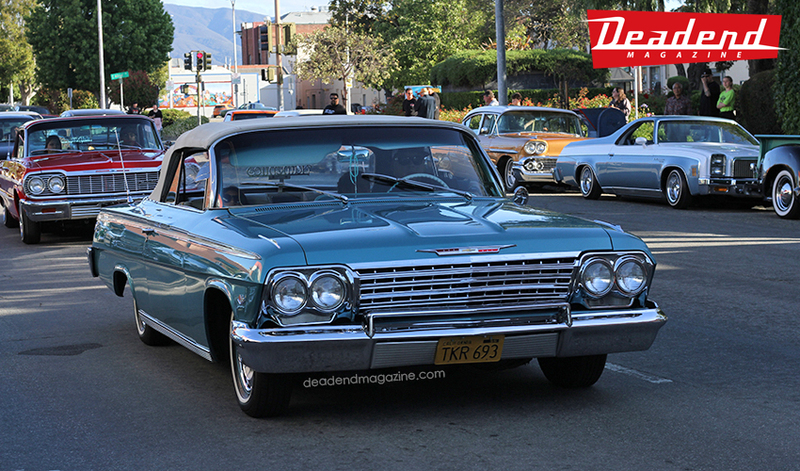 While we were celebrating our Deadend Magazine Japan familia was at the Mooneyes Street Car Nationals. Thanks to the talented Ken "The Flat Top" for pinstriping our skate deck. Sunday afternoon we headed to San Jose, CA to kick it with Klassics Car Club.